From Adelaide in the East, to Perth in the West, Alice Springs in the centre and Darwin in the North, this is Australia's iconic outback. It's big, it's red and it's full of atmosphere. Great Southern Railway run two of the world's great rail journeys. The Indian Pacific crosses the continent from East to West, running from Sydney to Adelaide and Perth, and The Ghan connects the Southern city of Adelaide to Darwin on the North coast. Both trains are luxurious and are wonderful ways to experience this unique land. In the more populated south-western corner there are trains connecting Perth with provincial towns in Western Australia. 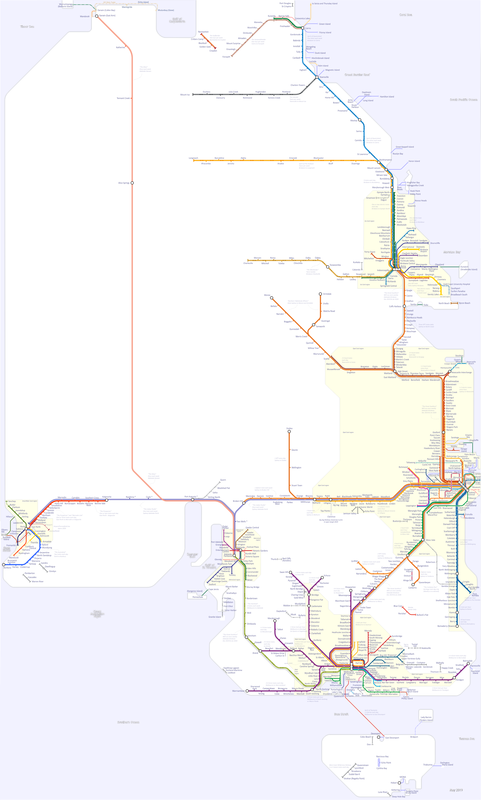 The Australind runs eastward to Kalgoorlie, the Merredin Link runs to Merredin, and the Avon Link runs a commuter service to Northam. The Australind train runs South from Perth to the provincial city of Bunbury. Suburban train networks serve the suburbs of Adelaide and Perth. Quick Journey Planner: Major towns. ➤ Full journey planner - all towns. Great Southern Railway's 'The Ghan' train runs once or twice each week from Adelaide to Darwin through the heart of Australia. 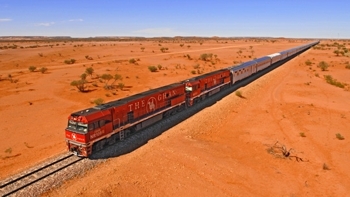 The Ghan has Platinum, Gold and Red class sleeping accommodation, as well as economy seats. The train has all the luxuries you would expect of one of the world's great railway journeys - lounge cars, dining cars and buffet cars. You can even take your car on board with GSR's Motorail service. This is a real adventure that showcases much of the diversity that Australia has to offer. You even have the opportunity for side trips and tours of major towns along the way. Schedule: Trains depart Adelaide just after noon every Sunday, and also Wednesdays in winter, travel through the night before arriving in Alice Springs mid the following day. After a few hours stopover the train continues its Northward journey that evening, arriving Katherine the following morning for a few hours stopever, then in the afternoon the final leg of the journey takes you to the tropical capital of Darwin. The return trip leaves Darwin every Wednesday morning (and Saturdays in winter), travels to Katherine for an afternoon side trip, then overnight to Alice Springs for another side trip the following morning, then overnight again before arriving Adelaide Parklands Terminal around midday the following day. Advance reservations are essential. Great Southern Railways' Indian Pacific train is one of the great railway journeys of the world. A real dinosaur of a train, it's not speedy but it is luxurious. There are deluxe, first and economy class sleeping berths, seating, dining cars, buffets, and lounge cars. Settle in and watch some of Australia's most varied scenery roll past your window. The train starts its journey from the Pacific Ocean in Sydney and heads West for a day long journey to Adelaide via Broken Hill. After spending a few hours in Adelaide, the train continues its westward trip across the great Australian outback, via the mining town of Kalgoorlie and eventually arriving at East Perth terminal. Schedule: The Indian Pacific departs East Perth terminal and Adelaide Parklands Terminal once weekly (or twice weekly in peak season) for the two day journey. You can even take you car on board with you between Adelaide and Perth! Advance reservations are essential for all travel on the Indian Pacific. Find and book conveniently located hotels online with Australian Rail Maps and booking.com. Book Online now. No booking fees. Pay the Hotel when you stay. Travel inland from East Perth Terminal along the scenic Avon River Gorge to the towns of Northam and Merredin and the outback mining city of Kalgoorlie on TransWA's fast and modern Prospector and Merredin Link trains. These are Australia's equal fastest trains. Standard features include personal music channels, new release movies, access to power points for laptop computers, buffet and special facilities for people with mobility difficulties. 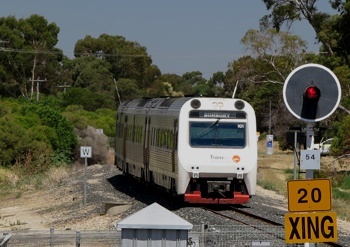 Schedule: Trains depart once or twice each day from East Perth terminal for Merredin and Kalgoorlie picking up at Midland at the edge of the Perth suburban area and at rural towns along the way. The trip to Merredin takes a little over 3 hours, and a little less than 7 hours to Kalgoorlie. There is also a short distance commuter service six days per week called the Avon Link that runs from Northam down to Midland connecting there with electric trains from Perth, and returning from Midland to Northam. You should reserve your seat in advance on Kalgoorlie and Merredin trains, but this is not necessary on the Avon Link service. 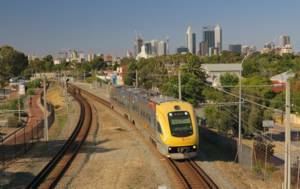 The city of Bunbury is connected to Perth by TransWA's modern and convenient Australind train. The Australind is fully air conditioned and snacks and beverages are available for purchase on board. Sit back, relax and watch the countryside glide by as you take the two and a half hour journey from Perth station to Bunbury. Schedule:The Australind departs Perth station twice each day for the two and a half hour journey to Bunbury. Trains depart each morning and each evening and pick up at Armadale then call at all towns along the way before arriving at Bunbury station. Trains also depart Bunbury early each morning and mid afternoon for the trip to Perth. Advance reservations are necessary on the Australind. Great Southern Railways' Overland train was Australia's first intercapital train. The name proudly announces its inland route between Melbourne and Adelaide to contrast with the sea journey earlier travellers endured. The Overland is today a thoroughly modern train providing a choice of first and economy class seats and an onboard cafeteria. This train is simply the most relaxing way to travel between Melbourne and Adelaide. After leaving Melbourne you will pass through Geelong, then nearby the majestic Grampian Ranges before skirting the arid Mallee region. As you approach Adelaide you cross the mighty Murray River and enter the lush Mount Lofty ranges. You will get spectacular views of the elegant city of Adelaide and the ocean as you descend from the hills before arriving at Adelaide Parklands Terminal. Schedule: The Overland departs Melbourne Southern Cross Station and Adelaide Parklands Terminal three times weekly in the early morning for the 10 hour daytime journey before arriving at your destination in the late afternoon. Advance reservations are essential for travel on The Overland. All aboard at the Pemberton Railway Station for these return services which meander through towering Karri, Marri and Jarrah forest, over trestle bridges spanning rivers and streams along one of Australia's most majestic rail lines. In springtime, September, October and November, the forest is resplendent with colourful wildflowers. As you admire the breath taking view on the journey, your tram driver gives an informative commentary on the forest, the Tramway and the history of the region. All trams stop at the Cascades for you to alight and experience the feel of the forest and then on to the Warren River Bridge. Schedule:Trams run south to the Warren River Bridge DAILY except Public Holidays. This unforgettable 105 minute service shuffles out of Pemberton, past the Saw Mill and descends deep into the Karri forest. The tram meanders through the forest, crossing six bridges, stopping at the Cascades and ending at the Warren River Bridge where the Lefroy Brook Joins the Warren River. Your tram then returns to Pemberton. 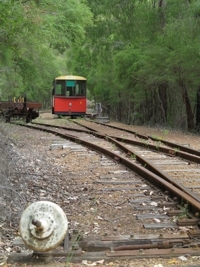 Pichi Richi Railway is a heritage tourist railway and operating museum, running regular heritage train journeys on the oldest remaining section of the famous narrow gauge old Ghan railway. Pichi Richi Railway has its headquarters at Quorn in South Australia's Flinders Ranges. 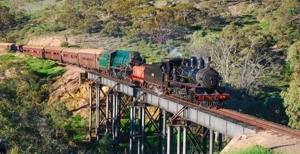 Schedule:Heritage steam, diesel and railcar trains depart from Quorn and Port Augusta on specific dates to recreate some of the Australian outback's great railway experiences of yesteryear.